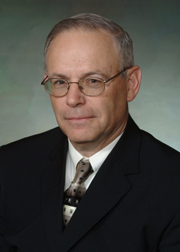 Republican David Wyant served on the Albemarle County Board of Supervisors for the White Hall Magisterial District from 2004 to 2007. He is a professional civil engineer and was an official in the National Football League. He was defeated for re-election in November 2007 by Democrat Ann Mallek. While on the Board, he appointed Duane Zobrist to represent White Hall on the Albemarle County Planning Commission. Mr. Wyant, a native of White Hall, Virginia, where his family still operates Wyant's Store, is the son of retired Charlottesville city letter carrier A. Clark Wyant. Since leaving the Board, Wyant has been active in the effort to change the way in which country stores are handled by the County. Wyant won election on November 4, 2003 by receiving 54.42% of the votes cast. ↑ Web. Wyant's Store to Reopen in Albemarle County, Spencer Burker, News Article, NBC29, September 8, 2017, retrieved September 11, 2017.